Yesterday, I started removing kitchen cabinet doors and getting them ready for paint when I realized that on the range/refrigerator side of the kitchen, I actually need to build the range hood cover before I can paint the upper cabinets. There will probably be some minor modifications needed on the existing cabinets and trim, so obviously I need to get that done before I paint. And to be quite honest, I have absolutely no idea what style of vent hood cover I want to build. There are three basic types that I’m considering: (1) one that’s integrated into the cabinets and painted to match the cabinets, (2) one that’s made of stained wood, and (3) one that’s made of metal or made to look like metal. The vent hood covers made of contrasting stained wood are also a favorite of mine. But for my house, I wouldn’t want the wood looking too rustic. Of all the stained or natural wood vent hood covers I’ve seen, this one is my absolute favorite. It’s made of walnut. Of course, I have cabinets on either side, and I’ll be covering up cabinets above my vent hood (I won’t be removing them), so mine can’t be shaped exactly like that, but I do love that walnut. That would bring in some of the dark gray that I’m using in other areas (e.g., my fireplace, doors, etc.) into the kitchen. I don’t even know how to make a choice. I like all three options. 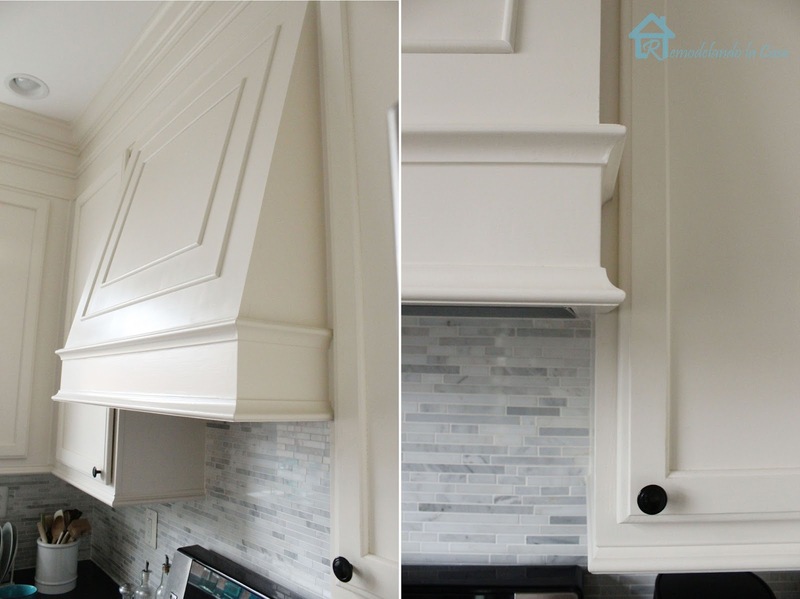 The integrated range hood painted the cabinet color is a much more refined look. The wood adds warmth to the room, and I’m looking for ways to add wood and warmth to my rooms. And the dark metal look brings some of that dark gray into my kitchen that coordinates with the other dark grays. I literally have no favorite here. How in the world am I going to choose? By the way, I made a small change to the finish on my breakfast room dining table yesterday, and it made a big difference. I added new pictures to the end of yesterday’s post. Click here to see the change I made if you missed it. Can you photoshop each style into your own kitchen? 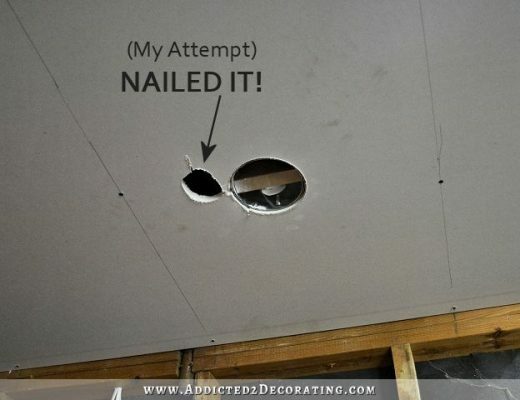 Or make a mockup out of a large cardboard box and stick it up there? Enjoy your blog! This would be a great way to see what might work best for you. I personally like the wood one sized to your kitchen as I think it would add some warmth and contrast or even one made with stained wood in a simpler design. Love the dining room chairs and think what you did to finish the table was perfect – much better than what you originally did! For what it’s worth, I think the warm wood gets my vote. With all the white (backsplash, counters) and the cool blue you’re painting the cabinets, I think a little warmth would be good. That’s my feeling but you’ll be living with it, so that’s what matters! Good luck choosing! Can you update this post to include a picture of your kitchen looking at the range wall from your newly cleaned-up breakfast room? Without seeing the picture, I think integrated or wood would be nice. I’m not sure about that much metal in your kitchen. But, honestly, your kitchen is not that large and the ceilings aren’t that high, so I worry that anything other than an integrated one will look too busy. I’m casting my vote for the same color as the cabinets. If you are thinking of adding warmth with wood and you have to do something about your counters any way, what about wood counters? Your condo kitchen was so very, very pretty. My two cents. I agree with Peggy I think painted range hood cover to match with the cabinets. I share the other poster’s concern about there being too much in a small kitchen if you go with wood, BUT, I absolutely love that choice if you think it works in the space. The wood and metal hoods are nice but I think they will be too much for your kitchen. You already have many elements and the real decorating hasn’t even started yet! The painted version will be a classy, understated addition. My two favorites are the 1st integrated cover and the walnut one!! I love the details on that integrated cover and somehow it reminds me more of the kind of trimming found around your house than the 2nd integrated cover. The walnut one is just a piece of beauty! I love how it stands out against all that white but as you did say, not only will it be between two upper cabinets in your kitchen it will also be standing against teal instead of white so I think it might still look warm but less crisp as that specific image. However, the teal and wood combo with the wood backsplash blew my mind and i HAD to pin it!!! So I don’t know what to think anymore! Good luck making a choice! I have no doubt it will be beautiful AND the best choice for YOU! Kristi, all three are so pretty. At first I thought definitely the painted hood until I saw the metal. It is hard to choose. The metal is different and if you don’t like it, you can always paint it! I see the warmth of wood you are looking for, I’d vote for integrated. The time you have, and this project idealy should be more complete to finish it cleanly with other details properly before the end of March. Also the space for it is fairly short, especially with keeping the cabinet over it. Maybe design it with a plate ledge and place a beautiful cutting board on it… you can always add more wood with accessories. Excellent suggestion from SEWDUCKY. I totally agree. I vote for integrated also. I like both of the wooden styles you showed. You already have a lot of different textures and colors going on……teal cabinets, white tile backsplash and walls, concrete countertops, brass cabinet hardware and lighting, stainless steel appliances and those gorgeous wood floors. 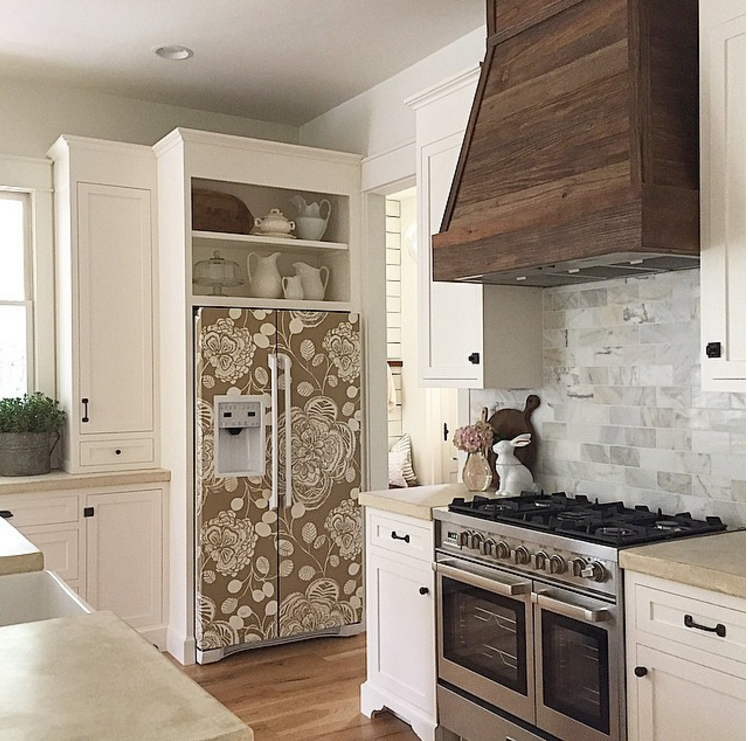 I think either the wood or the painted range hood option would look great in your kitchen. First, you table touch up is beautiful. 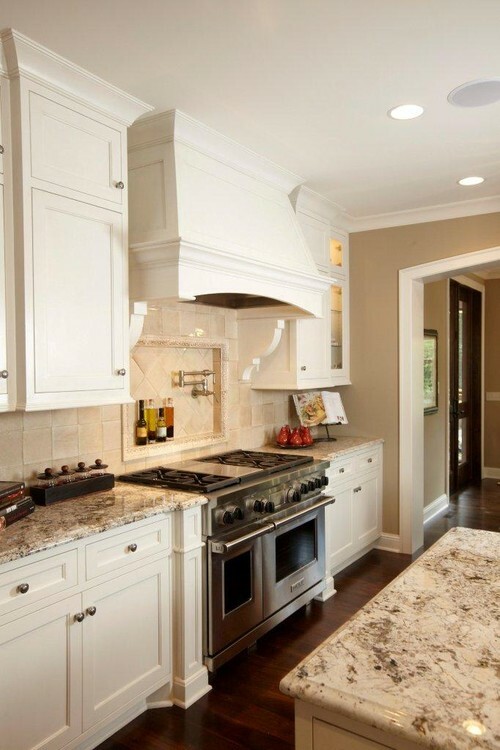 For me, I like the integrated hood, I worry that you might end up with too many focal points in a small room. Having said that, follow your heart…you do great work! 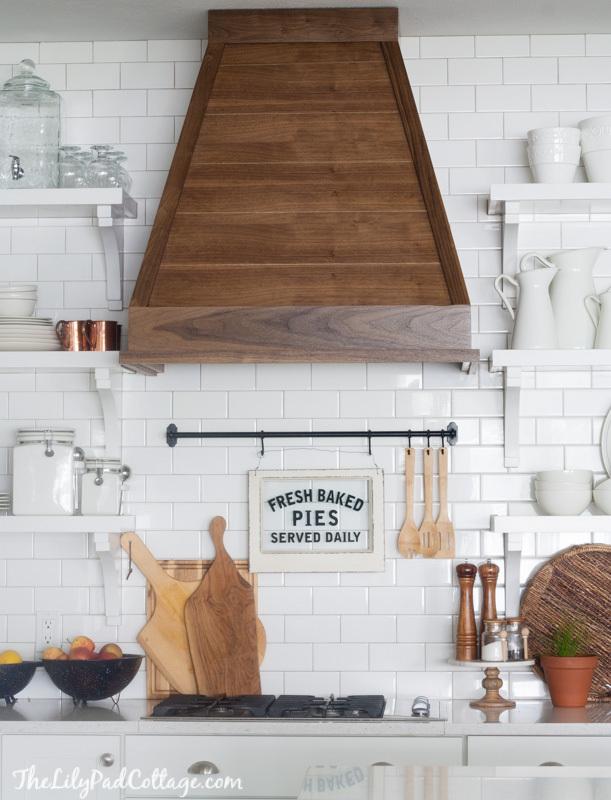 How about a clean, refined, stained wood vent hood? Something simple with clean lines and with the warmth that you like. Wood hood, plain in the same color as your round breakfest table you just finished, soft /bjuitiful. Another vote for integrated. I think it works well in your small kitchen. Love the change you made to the table. I liked it yesterday but thought the same thing,that it lacked some warmth. Good job! Question: Have you ever considered a sprayer for all your cabinet and furniture painting? i have sprayed many cabinets and chairs and would have pulled my hair out without one! Maybe you have discussed this option in a previous post I missed. I think integrated. You have a very simple stove and refrig and ignoring you make too big of a focal point I think it will look odd. I’m on team simplicity!! The integrated hood seems like it would be a better fit between your cabinets. BTW, are you still going with the grass cloth wallpaper in the breakfast room? Is Peeve still overseeing the redo? And yes, my sweet Peeve oversees all of my projects. 😀 She’s such a curious little thing. You did a beautiful faux grass cloth experiment way back when in the music room have you thought about that as a possibility for the breakfast room? Also, there are some beautiful wooden pulls/knobs that could bring warmth to the kitchen if you go integrated on the range hood. You have a metal rangehood now, correct? I like the metal for the ease of cleaning. 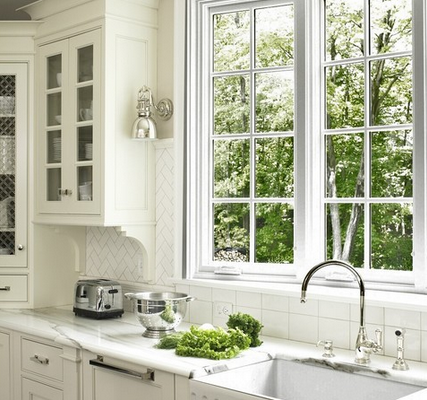 Would it be possible to build the style you like over that hood so you have the wood look to match your cabinets but the ease of clean-up with the metal inside? I have no idea if this is a possibility but I’m looking at what I consider the practical aspect of it. I would definitely do integrated! I think that anything else would cause the vent hood to become the focal point in a kitchen that size. Hi Kristi, I really like all three options and would have a hard time choosing on looks-though I probably lean toward the wood for the same reasons as you…but the very practical side of me…and the one that has to clean the kitchen says whichever you choose needs to be very “cleanable” I would worry that the wood one would either catch grease and then dust and be hard to clean unless it was very smooth with lots of poly, and if you paint wood like metal that with frequent cleaning it would wear badly. I have a microwave over my stove that gets gross so quickly. I guess it also depends on how often you cook 😀 I love your cabinet color! When I first started following you it was your color choices that first brought me to your blog! The dining room chairs are FABULOUS! The hoods you show all seem to be for larger ranges than you have. I agree with the suggestions that you do an integrated hood. I’m thinking the narrow hood with contrasting material would look like an afterthought and not part of a design plan. And you will have the wooden blinds. The blue uppers and lowers look good in your condo, but may prove to be too much for your entire kitchen with the low ceiling. You can’t go wrong with white on the uppers. I love following your adventures. You are one more gutsy woman! I think the style of the Blake Shaw hood in the Wanut wood tones would be perfect! No kidding- girl can do it all! Ha! It really is something I want to learn. I just don’t even know how to go about getting started. Perhaps I need to call a local metal works place and see if I can just observe for an hour. Or a day. I vote for the walnut wood! I choose the first photo. Seems to flow well with what you now have. If you had a wide open, large kitchen, with a six burner range, I would opt for the other two styles, but I think the wood or metal look will overwhelm. You have wood (floors) so that is in the mix, and you can accessorize with metal, maybe with an art piece or practical items. Too much contrast in a kitchen that size, with a standard height ceiling, will become claustrophobic to me. I am at the exact same stage of deciding on and building my range hood, so PLEASE do a step by step picture tutorial for us! The thing that is holding me up is deciding how to tie the hood into the existing cabinets so that the doors still work on the cabinets. I like the integrated option. 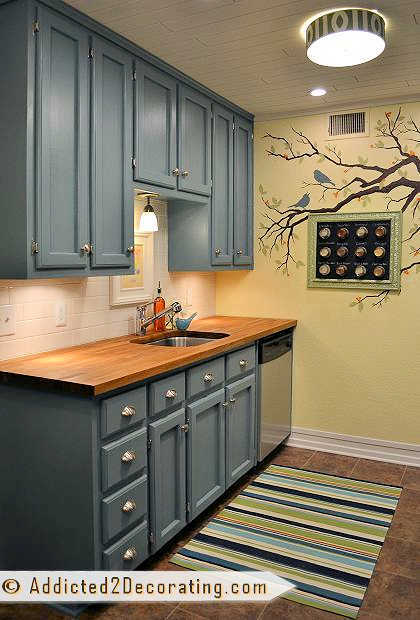 The Walnut examples are beautiful next to white cabinets, but I wonder if it would be too much with the teal cabinets. Have you considered the same finish as the newly completed table? That would tie the Range Hood and table together nicely. Again…you have picked amazing designs. I love the classic one….simple, elegant to a degree….never tiring of such…..but that painted to look like metal….YOWSER!….that would be amazing! Keep it simple. Your kitchen is too small for anything too fancy. Like a lot of others I like the greatest range painted the color of the cabinets in small kitchens. Especially when there’s a dramatic color like your planning. The metal range hood made me laugh because the 60 homes which were built in 1975 in our complex all had that exact middle range hood and only those who haven’t remodeled have toss them out. If you decide that’s the way to go you might check eBay to see if you can get one for a little money. BTW, that kitchen in the second photo of integrated hood (with the glass upper cabinets) is gorgeous. Can I make my kitchen magically look like that? Can’t tell you enough how I love your blog!! 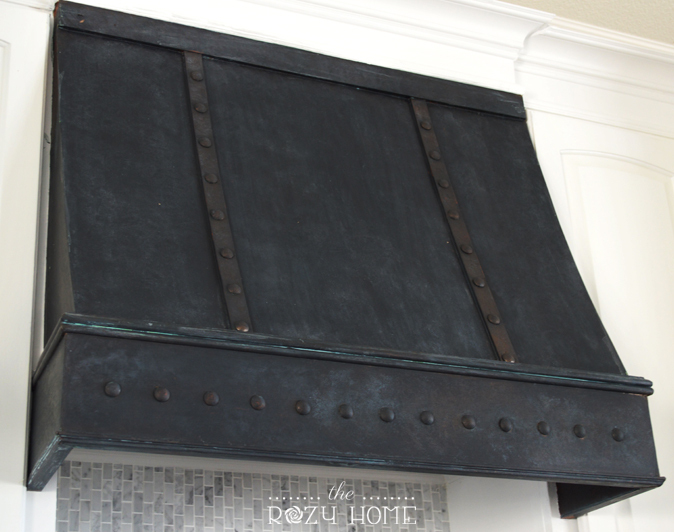 I wanted to send you a pic of my range hood as it has actual storage built around the pipe/vent and it has a “mantel” as I call it. Very stream lined and beautiful. We just put white subway tile in yesterday (hired it done) and used a dark brown grout. Looks awesome!! 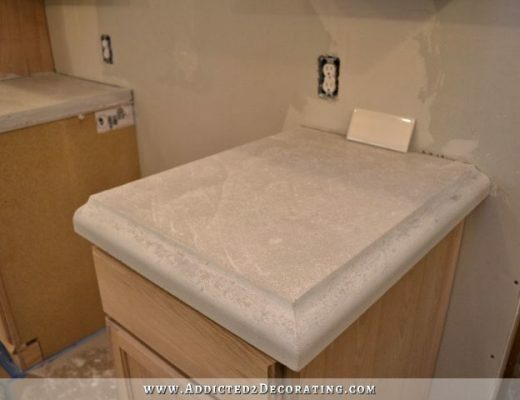 Our cabinets are white and counters are a dark brown granite. Whatever you decide will be awesome! I hate to tell you what to do- I like to see you arrive at your choice without influence from us, but…. I think you will love the wood option. It will bring some warmth up the wall and I think you will love it.